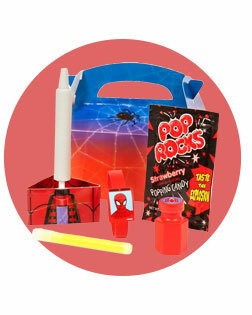 Your big birthday boy and all of his guests will be ready to swing from the tops of the tallest buildings in New York City with Spiderman Party Supplies! Create a great party based on this classic comic book character with tableware items like paper plates, cups, and napkins, favors and items like personalized candy bar wrappers, personalized mugs, and party blowouts, as well as decorations like treat stands, photo props, and balloons! It's your friendly neighborhood Spider-Man! Get ready to swing into action to plan your next birthday extravaganza. 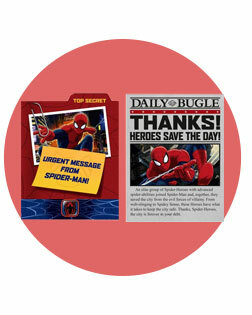 You'll be a part of everyone's favorite Spidey story when you find all of the birthday supplies you could ever need! Let your little ones tap into their Spidey senses and they'll be shooting webs and swinging from buildings, pretending to save the day. No matter how many friends you invite, it's easy to plan a party when you can find everything you need all in one place! Become the world's best party planner today! Call around to local video stores or movie theaters to see if they have any old Spiderman movie posters. If not, print out movie stills and make a collage to decorate the party area. The kids will love feeling like they're in a movie scene. You've decided on a Spidey theme, now get in the spirit and start planning a party that will become the talk of the town. Find all the ideas and inspiration you need on the Birthday Express Ideas and Inspiration blog. From décor ideas to delicious treats, our blog equips you with all the creativity you need! Let your child's friends know that it's time to put on their red, black and blue! These invitations send an urgent message from Spiderman: It's time to party! Then after the party's over, teach your child the value of good manners when you have him or her send handwritten Spiderman thank you cards. 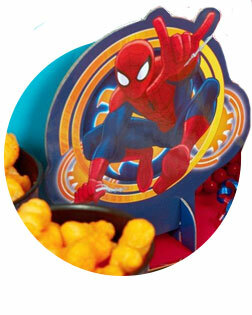 Balloons, cake toppers and table decorations, don't leave anything out for your Spiderman fiesta! The more decorations you have, the more festive the occasion will feel. Excite your guests and make your little one feel as special as possible on his or her big day. Don't leave any details out, because you can decorate with your Spidey theme right down to the plates for cake and ice cream! And of course it wouldn't be a party without banners and balloons! Welcome your guests with a birthday banner to fit your Spiderman theme. Liven up your party space with a personalized banner that is sure to have the birthday kid grinning from ear to ear. Decorate the party area with red and blue balloons to honor your son or daughter’s favorite superhero. Spiderman Head Shaped Foil Balloons will add extra pizazz when you tie them to each chair at the table. The best part of a birthday party is watching the guest of honor blow out his or her birthday candles! Make the most of your birthday treat time when you use Spiderman plates, cups, plasticware, tablecloths and more. The more decorations you have, the more excited your guests will be to celebrate their friend's special day. One of the hardest parts of throwing a birthday party is filling the time with fun activities. Birthday Express has you covered with a wide variety of activities to make the party a great success. From party classics like a piñata or potato-sack race to dress-up and photo opportunities, your guests will never run out of games to play. Don't waste any more time worrying about how to keep the kids busy. These party favorites will delight each and every guest! It wouldn’t be a Spiderman party without Spiderman himself. Let the guest of honor show off his Spidey style in a comfortable Spidey suit. He’ll look the part in this officially licensed costume. Make your Spiderman party one to remember. Party favors are the best way to let guests bring a piece of the party home to their families! Don't worry about coming up with ideas for elaborate party favors. Everything you need is right here, already organized into favor packs and boxes if you choose! Treats, tattoos and knickknacks galore make your party the talk of the town, until your next epic birthday party that is! What kid doesn’t love tattoos? Moms and dads love ones that easily wash off! 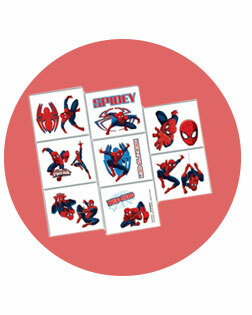 Let the kids do Spidey tattoos at the party, or take them home to remember the fun they had!